April 1, 2009 -- Steven Schick, author and champion of contemporary percussion music, is the featured lecturer in the final event of Arkansas State University’s Lecture-Concert Series. He will present “Champion of Contemporary Percussion music” on Thursday, April 9, at 7:30 p.m. in Riceland Hall, Fowler Center, 201 Olympic Drive, Jonesboro. Like all events in the Lecture-Concert Series, this event is free and open to the public. Steven Schick’s presentation is co-sponsored by ASU’s by ASU Bands, the ASU Department of Music, and the Society of Composers, Inc. student chapter. 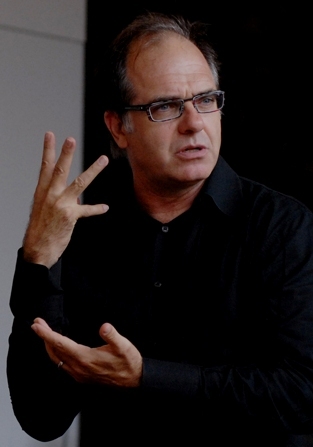 Steven Schick, distinguished professor of music at the University of California-San Diego, and a consulting artist in percussion at the Manhattan School of Music, has championed contemporary percussion music as a performer and teacher, by commissioning and premiering more than one hundred new works for percussion. Founder and artistic director of the percussion group “red fish blue fish,” Schick assumed the post of music director and conductor of the La Jolla Symphony and Chorus in 2007. He has authored a number of publications including “The Percussionist's Art: Same Bed, Different Dreams” and “The Mathematics of Resonant Bodies” on solo percussion music, and a three-CD set of the complete percussion music of Iannis Xenakis. Schick will perform solo and with the Arkansas State University Percussion Ensemble. Steven Schick will present a percussion clinic for middle school and high school students at Fowler Center on Friday, April 10, at 10 a.m. The public is invited to this clinic by master percussionist Steve Schick. Besides being a tremendous performer, Mr. Schick is very adept at speaking to high school, middle school, and college-level audiences. Mr. Schick is well known for premiering major percussion compositions. Parking for the percussion clinic is available on the north (Convocation Center-side) entrance of Fowler Center. For more details, contact Dr. Gil Fowler, associate dean for the Honors College, at (870) 972-2308, via e-mail at gfowler@astate.edu, or visit http://asunews.astate.edu/L-CFlyerGENERALrel08.htm.astate.edu for a complete listing of the 2008-09 Lecture-Concert Series programs and a printable flyer. The Lecture-Concert Series presents diverse programs to enrich the cultural life of the campus, community, and region.